Published on July 6th, 2009. Just a scant day after I was using the mythical man from MI6’s movie mug to mock our former colonial overlords for their upperclass-twittery, comes the Telegraph of London to report that, unlike in these United States, perhaps there’s still a bit of that Anglo Saxon Magna Carta lust for freedom in ye olde English judiciary. Well, maybe not so much if you insist on some “there’ll always be an England” point of view on the whole lot. 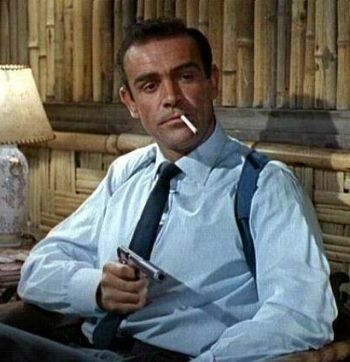 Still, is it true what Dr. No said to James Bond, “East, West, just points of the compass, each as stupid as the other”? I’ve never bought that moral equivalence argument. There must be a stupider direction on the compass! OK, well, how about the European Court o’ F’rinstance, to which the once ruddy rulers of the waves have turned over their hard-fought yeoman rights? In fact on in this episode, the Euros demonstrate that when we point the finger of foolishness, sometimes the direction of dumb points right this way. For despite my prejudices against both the theory and the practice of Euroism, and even if they’re still confused themselves about even what they think, I have to admit that there are times, such as this one, when we can and should learn something from Over There about such central moral challenges as intellectual property rights. 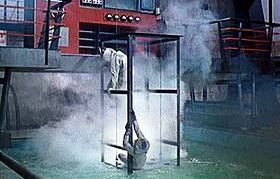 Danjaq[, the company that manages the James Bond IP rights,] claimed there was a risk of confusion because of 007’s association with the terms Dr No and Dr NO, as used in the film and related promotions. But the judges argued that the essential function of a trademark was commercial recognition — and Dr No and Dr NO as used by Danjaq were artistic, and not commercial, signs. The judgment said: “Those signs, affixed to the covers of the video cassettes or to the DVDs, help to distinguish that film from other films in the James Bond series. The commercial origin of the film is indicated by other signs, such as 007 or James Bond. What was that first word, again, Mr. Bond?